There's nothing better than making a trip to the North Carolina High Country region around the period of late November and early December to pick out and purchase a NC Christmas Tree from the region where they grow the best! The gorgeous mountains in Western North Carolina near Avery County in gorgeous Boone NC have a fantastic climate for growing Fraser Fir Christmas Trees and as such there are numerous NC Christmas Tree Farms that dot the countryside of the mountains. Not all of the NC Christmas Tree Farms are not created alike though; some only sell to wholesalers, some are quick in-and-out stops, and some like to create a family friendly holiday atmosphere where families and groups feel comfortable and relaxed searching for their Fraser Fir Christmas Tree in the crisp autumn air. Cornett Deal Christmas Tree Farm welcomes families and groups of all kinds to the High Country this tree season, and we have the best NC Christmas Trees in the area! We provide a great holiday atmosphere while you are on your search; enjoy activities like hayrides and 'Find the Perfect Christmas Tree,' snack on delicious Christmas refreshments like cider, hot chocolate and cookies, and spend some time browsing and shopping for handmade crafts and unique items such as Christmas tree ornaments, wreaths and other festive holiday decor. Our NC Christmas Trees are the best and we accept all major credit cards. Many families and groups that come to our family owned and operated Fraser Fir Tree Farm in NC like to make the experience a whole weekend getaway, staying multiple nights and days. There are lots of activities and events going on throughout the NC Christmas Tree hunting season and you can choose from a host of shows and live performances during the Appalachian Performing Arts Series and even cheer our home team by going to an ASU Football game if a home game is happening during the weekend you choose to come. Also, during a few of the weekends, fun fall festivals and parades will be taking place in the High Country; these events are great places to find neat, handmade gifts and collectibles and shop for a variety of items. These are just some of the wonderful things that are always going on during this time of the year. If you are planning to visit our Boone NC Tree Farm to select a NC Fraser Fir tree and enjoy a relaxing, fall weekend with your loved ones, then plan to stay in our cabin rental. 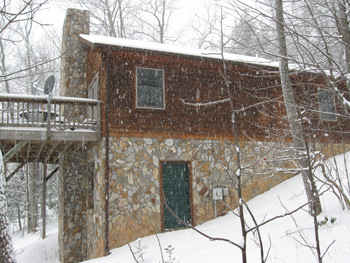 Cornett Deal Christmas Tree Farms owns its very own adorable, NC mountain log cabin right near the tree farm property. A 2-bedroom, 1-bath cabin, it sleeps 6 and is available as a log cabin rental for these kinds of trips and quick family getaways. Equipped with everything you need for an unforgettable getaway and time spent searching for the perfect Fraser Fir Christmas Tree, Songbird Cabin has a cozy fireplace for those chilly evenings, satellite TV, a rec room complete with a pool table, linen and bed furnishings, as well a fully equipped kitchen and laundry area. If our log cabin rental, Songbird Cabin is not available the weekend that you are planning to come, there are other great cabin rental companies in the area, one such being At Your Wit's End Vacation Rentals, which has a host of cabin and rental accommodations available for your trip. If you would rather be pampered while on your trip, stay in one of the many adorable bed and breakfast cottage accommodations in the area. There are numerous locally owned and operated places to stay in the area. Start planning which weekend you would like to come up today, and learn more about our amazing NC Christmas Trees. We have included information about our outstanding North Carolina Christmas Tree Farm, our family and their accomplishments, and tons of information on Fraser Fir Tree Care, why you should buy a real tree instead of a fake plastic one, and much more! by "Cornett Deal Tree Farm!" For other accommodations, click here.